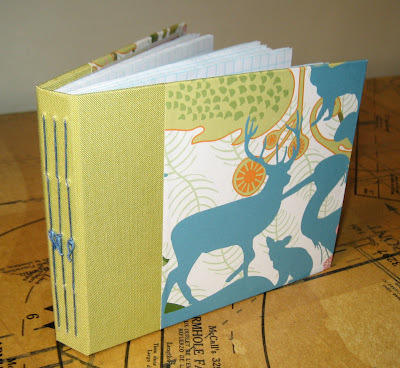 The next swap book to present, is this one from Alison, of Kurberry.Etsy.com. Alison says, this is "a three signature book - the Blue Deer. The covers are a paper I bought in Amsterdam, colorful and crisp, and it made me think of spring. The inside face of the cover is from the same source but bolder and geometric. 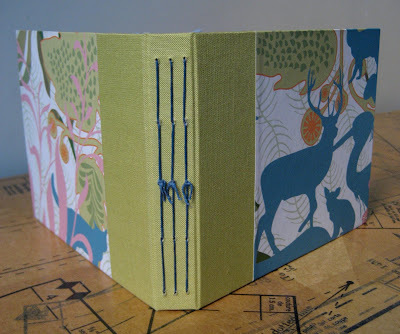 The signatures are bound to the light green book cloth spine with waxed blue linen thread." Visit Kurberry.Etsy.com to see more of Alison's books. What a fun paper, and nice book! The paper is great! Very pretty book.